The following new necklaces completed yesterday and listed for sale on my Etsy shop Today! Each circle link is hand formed, soldered to give an organic feel, connected to double layer chain. Measures 17" plus 1" extender. Natural blue turquoise nugget makes an asymmetrical uniqueness with a sterling silver tassel on the other side. Simple boho appeal. Measures 20" plus 1" extender. Colorful and Fun! 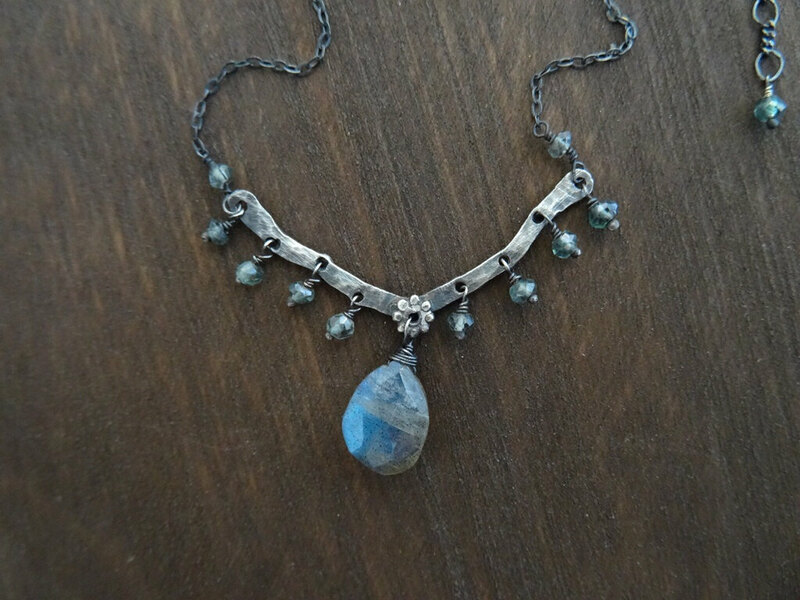 Each gemstone drips from a different layer of sterling silver chains, making a layer. 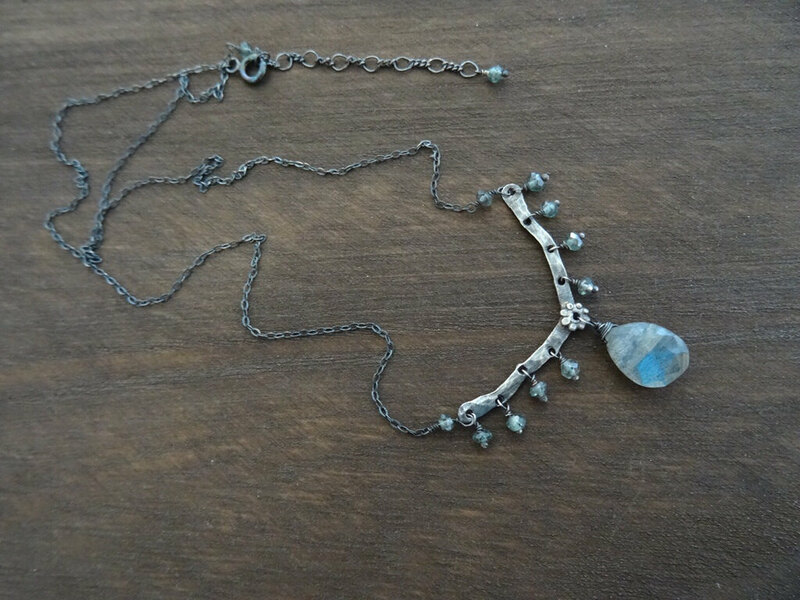 Delicate yet outspoken one-of-a-kind necklace. The shortest chain measures 24". Pointy natural raw crystal quartz releases precious sparkles, uniquely topped with layers of sterling silver chains to make a simple yet goth chic look. A tiny freshwater pearl connects each chain. Unique one-of-a-kind heart with bezel-set pear garnet double-wrap bracelet, inspired by Valentine's Day. 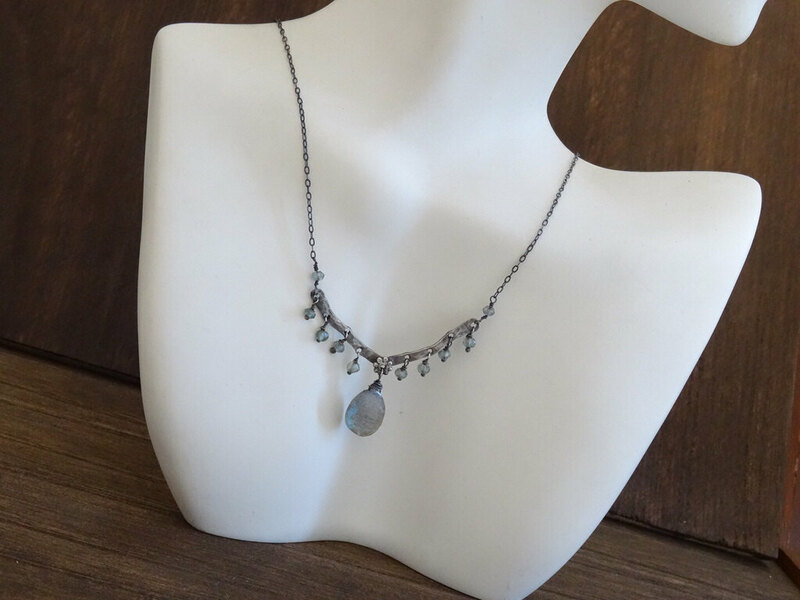 The sterling silver is oxidized and textured to bring out a little rustic boho feel. Measures 14", the heart 20mm in width. Shown below is a part of the process. Completed a new necklace today. I curved the bezel and added some copper balls to make it look a little tribal boho. New boho Victorian chic necklace for sale! Measures 17" plus 2" extender. New Minimal Boho Bracelets on Etsy! New minimalist style rustic boho bracelets accented with semi precious gemstones joined by a lucky charm or beach sand dollar charms. Maybe the sky heard me complaining about the freezing temperature, we suddenly had such a warm, beautiful day today. Loved it! A little late greeting, but Happy New Year!! Wishing you lots of happiness in 2015! I've been hearing about many places on earth experiencing incredibly cold winter with snows, while Southern California isn't an exception. This is making me want to stay home a lot despite the refreshing feeling. I've worked some new jewelry, bracelets, today, will post later!